Fungal and Yeast Infections are listed alphabetically on this page. This guideline has been written by our practitioner Sarah Beesley (MHD Hons) to provide a comprehensive approach. The best result is gained when the whole guideline is followed. Please be aware that results may vary and that if you have any pre-exisiting conditions, we advise working with a trained practitioner. Fungal and yeast infections can be either external or internal. They are most commonly caused by the Candida yeast or fungus and if chronic, need to be addressed systemically as well as topically. For the purposes of this article we will refer to Candida, but the same set of guidelines can apply equally to any other fungal infection. Our normal body flora includes some Candida yeast, so the aim when addressing Candida infections is not to eliminate the yeast but rather to reduce its population and then enable the body to keep it under control. Yeast and fungi typically over-grow only when the body environment permits them to do so and an over-growth usually heralds a deeper problem; particularly if the fungal infection is repetitive or chronic. For a chronic fungal infection to be addressed effectively, we have found the best results are achieved through working on the outside and the inside of the body simultaneously. Using Purely Earth Clay topically to assist in removing the fungus from the dermal (skin) layers which receive little or no blood. Using Purely Earth Diatomaceous Earth to assist with breaking down pathogenic biofilms that that exist in the gut. Biofilms provide hiding places for bacteria, yeasts and fungi. Using a chitin inhibitor to work on the inside. A chitin inhibitor such as Fungal Stop will go wherever blood goes. Using Purely Earth Essential Detox Minerals to ensure the digestion and detoxification systems are well supported during the clean up process. Removing the fungus feeders. These are foods which support the yeast growth and are identified on our How to use Fungal Stop page. When the clay is removed, follow with a light spritz of Purely Earth 2% Lugol’s Iodine, white vinegar and water. Do 200 ml of 50/50 water and white vinegar to 20 drops of iodine. If wearing boots or closed shoes during the day, use a dusting of clay powder over the feet before putting any socks and footwear on. 2 weeks of preparation should always be done to lower the amount of detox reaction that may occur when the fungus is killed off internally. Do 2 weeks of Purely Earth Essential Detox Minerals at 1 drop per kg of body weight for children under 10 and 2 ml for adults daily. Take 1 generous tsp of Purely Earth Diatomaceous Earth in water or diluted juice last thing at night. Take Dr. Wilson’s Squeaky Clean at 1 cap 2 x daily to help populate the gut with good bugs and to sweep the gut lining clean. Remove the fungus-feeding foods. These include any foods made with sugar, most baked items, white or yellow cereals, sugary cereals, bread, alcohol and yeast-containing foods. Please ensure your bowel is moving every day before you start and seek help from our practitioner Sarah or another practitioner to achieve this if necessary. Continue the above through out the cleanse process. If you are not pregnant, use a chitin inhibitor such as Purely Earth’s Fungal Stop to treat the infection systemically. Make sure you follow the manufacturer’s instructions closely. This part of the process should ideally be done under the supervision of a practitioner. The total course of chitin inhibitor must be completed. In the case of chronic stubborn infection, a second course may be required. Cut back any surface diseased tissue using a sharp, clean knife. Do not go too far into the hoof/foot – the clay will clean up the rest. Dust the hoof thoroughly with copper sulphate. Pack the hoof/foot tightly with Purely Earth Clay and water made into a thick putty. Pack daily or every second day as a minimum. For instruction on making a clay pack click here. Keep the animal on drier ground if possible. Check the animal for zinc and copper deficiencies. Correct if deficient. Use Fungal Stop mixed into feed. To provide the necessary fat content for absorption, add a generous portion of ground flaxseed meal for herbivores. Use animal fat, egg yolk etc… for carnivores. Mix 1 generous tbsp of Purely Earth Diatomaceous Earth into the feed per animal. This assists with strengthening nail tissue. Cover the toes or fingers and nails daily with Purely Earth Clay paste. Make sure you get the clay in around and under the nail. You will need to continue doing this daily for a couple of hours each time until the nail has completely grown out. Follow with a nail bath of apple cider vinegar. Ensure all shoes have been treated for fungus and if this can’t be done, replace them. Dust the toes with clay powder before putting feet into enclosed foot wear. Take Dr. Wilson’s Squeaky Clean at 1 cap 2 x daily to help populate the gut with good bugs and to sweep the gut lining. The total course of chitin inhibitor must be completed. In the case of chronic stubborn infection, a second course may be required. Use Purely Earth Clay baths daily for 30 minutes each time for 3 weeks. You can also apply the clay as a paste to the genital and groin area daily for a minimum of 1-2 hours at a time. Apply the clay and then cover with cotton underwear. Remove the clay with paper towels as much as you can and wash the rest off in a shower or bath. 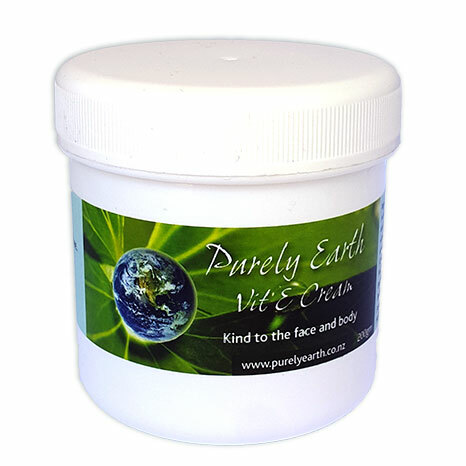 Use Purely Earth Vitamin E Cream sparingly to follow the baths or packing. You may want to add some Peppermint essential oil to the cream to reduce the itching. If you are not pregnant, use a chitin inhibitor such as Purely Earth’s Fungal Stop to treat the infection systemically. Make sure you follow the manufacturer’s instructions closely. This part of the process should ideally be done under the supervision of a practitioner. Use a non-chemical shampoo and conditioner. Add 4 Tbsp of runny clay paste to the shampoo and mix in well. It is often easiest to remove the shampoo from the bottle, stir in the runny clay mixture and then rebottle. To make a runny clay paste mix 1 Tbsp of clay powder into 1/4 – 1/3 cup of water and let the clay dissolve into the water. Do a final rinse over the scalp of Purely Earth Essential Detox Minerals to help with controlling the yeast and to improve the health of the skin. It is easiest to make these up by putting 2 ml of the minerals into a squeezable plastic bottle with around 150 ml of water in it. Squeeze this all over the scalp after washing the hair and leave in. Towel dry hair and style as usual. If the hair is short, making a runny paste of the clay as above and applying it to the head for a half hour daily will often address the issue quickly. It will also relieve itching almost immediately. Take activated B vitamins to support scalp health. Use 1500 – 2000 mg of Vitamin C daily. For seborrheic eczema around the mouth, nose, hairline and eyebrows, pack some clay paste over the affected areas and leave on for 30 minutes each day until gone. Follow each lot of packing with Purely Earth Vitamin E Cream with our Lugol’s Iodine added. We recommend 2 Tbsp of Iodine to each 200 gm pot of cream. Skin rashes often have a yeast or bacterial infection present. Use Purely Earth Clay baths 2-3 times a week for 30 minutes each time and apply Purely Earth Vitamin E Cream to the skin after each bath or as needed. Use a mix of Myrrh tincture and Purely Earth Clay as a liquid to swill around the mouth several times a day. This can be made by putting 2-3 tablespoons of the clay powder and 3 tbsp of myrrh tincture into 500ml of water and leaving it to dissolve over a couple of hours or overnight. Shake the mix up before use. Squirt the liquid into the mouth and swill around for as long as possible. It is safe to swallow. Try to do this 4-5 times a day. Myrhh tincture can be purchased through Sarah’s dispensary by emailing dispensary@ihug.co.nz. 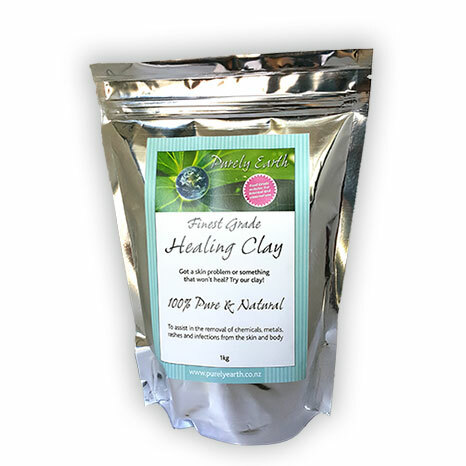 Take Purely Earth clay internally as a runny paste 1-2 times daily to reduce the yeast levels in the gut. Use the guideline for using clay internally. Use clay as a tooth paste daily instead of commercial tooth paste. Use Purely Earth Clay as a vaginal douche. Fro instruction on how do to do this click here. Douche daily to start and then as needed. This is especially helpful for pregnant women where the use of standard anti-fungal treatments are not always an option. If the thrush is on the labia (outer and inner lips) or external parts of the vaginal area, apply a clay pack and leave in place for several hours daily for a few days. The relief from itching is often almost instant. For instruction on making a clay pack click here. Insert a Lactobacillus probiotic vaginally to help rebalance the flora. Fix the Digestion. Weak digestion leads to undigested food, and this creates the environment in the gut that allows yeast to thrive. 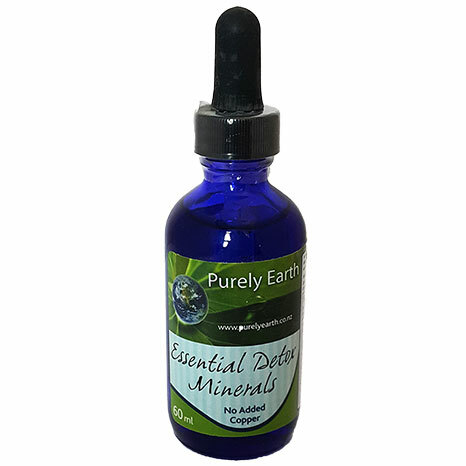 We recommend taking Purely Earth Essential Detox Minerals which provides the key minerals needed for healthy digestion and liver function. Immediately address any signs of weak digestion such as reflux, bloating, gas and indigestion. This can be done by using Betaine HCL or 1 tsp of apple cider vinegar (ACV) in water before each meal to increase the uptake of minerals through the digestive system. For those with a history of ulcers or who are using antacid medications, we recommend an appointment with our practitioner Sarah before you try Betaine. If you are gluten intolerant or Celiac, we recommend you use pancreatic enzymes with each meal to support small bowel digestion. This is a weak area for people with this condition and can allow yeast and bad bacteria to grow in the small bowel. Poorly digested food in the small bowel also increases the likelihood of a recurring yeast problem in the lower bowel. Chitin inhibitors work by stripping the fungus and yeast of their defense mechanisms, enabling the immune system to get in and do the business on the infection. The immune system requires zinc, Vitamin C, iron, Vitamin A and B Vitamins to operate well and these nutrients must be supplied to ensure a good outcome. If you have a history of low iron or heavy periods, get your iron and ferritin levels tested through your doctor. If you need iron, use a non-constipating form. Never use iron supplements unless you know for certain that you need them. The best foods for iron are dark green leafy vegetables and lean red meats. Eat a good quality protein at least 2 times a day. We do not recommend protein-deficient diets because protein is an essential nutrient required for repair, digestion and detoxification. If you choose to go vegetarian, get some good advice about how to get adequate protein within your diet changes. The World Health Organisation Standard is 1 gm of protein value per kilo of body weight. This means a 60 kg person requires a minimum of 60 gm of protein value per day in their diet. A palm size piece of fish for example, contains around 25 gm of protein content and 100 gm of tofu contains 10 gm. Protein provides the building blocks for your immune system. Eat lots of green and colourful vegetables to improve your pH. Medicine Chest Smoothie is an excellent way of boosting your nutrient levels if you have a busy lifestyle. Remove any margarines, butter substitutes or poor quality processed fats from your diet. Avoid foods made with vegetable oil, and for cooking use only very samll amounts of coconut oil, olive oil or butter. Take 2000-3000 mg daily of active omega 3 oil. Breathe! Shallow breathing means more CO2 in the blood and this is highly acidifying. Yeast thrive in a low oxygen environment. Deep breathing is the easiest and most effective way of oxygenating the tissue and reducing CO2 levels. Exercise helps this process as do meditation, yoga and Pilates if done correctly. Remove inflammatory foods and chemicals. We recommend getting our Food and Chemical Sensitivity Test done. Through years of testing we have found that almost every person with a yeast infection has a range of intolerances. Once the yeast or fungal issue is dealt with, a lot of these and other sensitivities tend to improve and reduce in severity but it pays to find out what your body may be having difficulties with to help it on its way to recovery. BREATHE DEEP. Breathing deep sends a signal to your body that you are safe. Shallow or fast breathing does the opposite and allows carbon dioxide to build up in the blood. Carbon dioxide is highly acid-forming. Using the above protocol may result in a reduced need for medication you may be using. We advise that appropriate monitoring be put in place. For example: If you have high blood pressure which is being controlled through mediation, get a cheap blood pressure cuff and monitor any changes at home. If your blood pressure drops, ask your doctor to reduce your medication accordingly. If you are on thyroid medication or cholesterol lowering medication, get your blood levels tested regularly.